Still holding up strong to some sort or support levels. 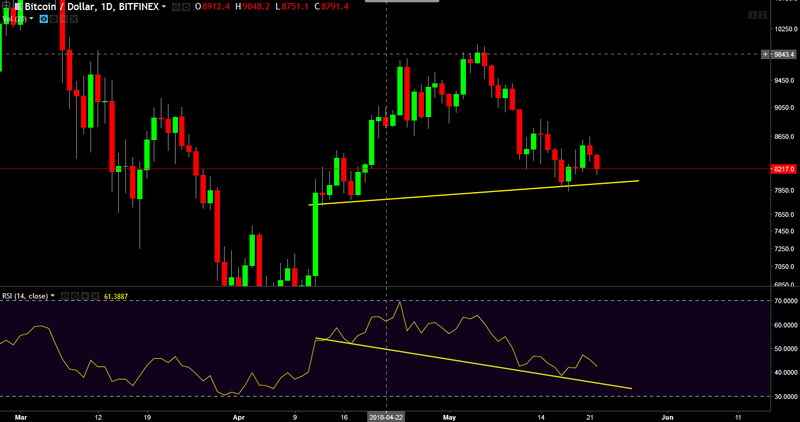 The chart patterns, divergence(bullish) will be used to determine the trend in price. The pattern acts as a continuation 62% of the time.A breakout occurs when the coin closes either above the top of the pattern or below the bottom of it. Trade with the trend(the trend is your friend)Since inside days act as a continuation pattern, expect the breakout to be in the same direction as the inbound price trend. Wait for price to either close above the top or below the bottom of the pattern before taking a position. A very clear different directional movement between the price and the oscilator. When price is making a HIGHER LOW and the oscilator is making LOWER LOW, this tends to give a bullish signal. Technicals suggests that more consolidation will likely take place before any new price trend. Disclaimer: This is for educational purposes,it is not intended as a financial advice. The analyst won't be responsible for a loss of fund. Trader should be able to manage risk.